Wong graduated from Dpt. of Music in Malaysian Institute of Art (MIA), major in composition, minor in piano. He attended Xi’an Conservatory of Music under tutelage of China renowned composer Prof Rao Yu-Yan and obtained Degree in Music, majoring in composition. 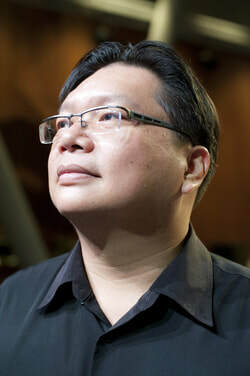 Wong since then serviced as Choir conductor, and actively work as a music composer and arranger back in Malaysia. Year 2009/2010, invited to participate in “Forumplus” - local composer music concert which organized by Malaysia’s Music Lover Philharmonic Orchestra. Year 2010, two percussion compositions was commissioned and world premiered by Best Percussion Group. Year 2011, Butterfly Lovers for Music, Dance, Video Art commissioned by Malaysian famous dancer Lee Swee Keong. year 2012/2014, invited to participate in “Hark ! the songs of homeland” - Malaysia contemporary new art songs and choir songs concert which organized by Chin Yong Music Festival. His music has been performed in China, Taiwan, Hong Kong, Japan, Philippines, Australia, Singapore, Vietnam and Malaysia. Wong is currently a visiting scholar of Nan Jing Normal University, China and a lecturer of Malaysia Institute of Arts, music department.